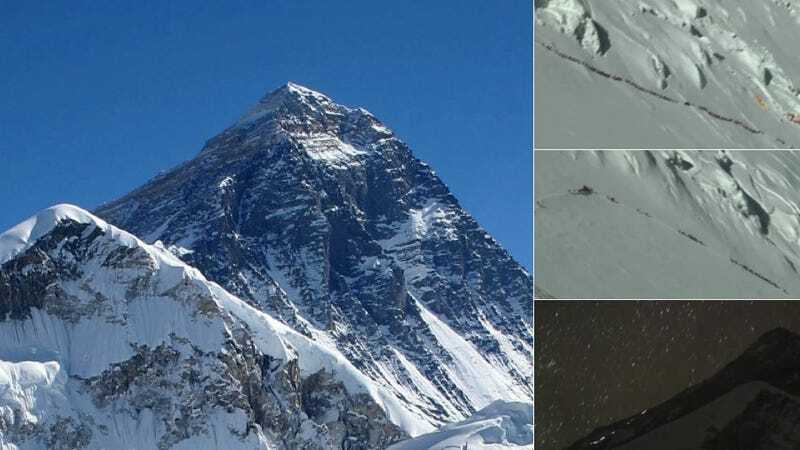 Even though four people died trying to climb Mount Everest last weekend and even if reaching the summit costs more than a Porsche, it's not stopping people from attempting to scale the highest point on Earth. In fact, there's so many people trying to climb Mount Everest that it's causing a human traffic jam. Outside Magazine has a stunning video showing hordes of people lining up and climbing throughout the day and night. If you look at the picture above, that trail of ant-looking smudges is actually people. The lights you see on the mountain at night? People. It's crazy, last weekend, 300 people tried to climb the mountain at the same freaking time. It's not going to get any better either, more than 200 people are expected to try and climb this weekend.